Breaking the silence after many months, director Michael Bay opened up on the future of the Transformers Live Action Movie Franchise. We currently do not know whether Mr. Bay will return to the director’s chair or will prefer the backseat as a producer, but his statement implies that he is involved in some way. Michael Bay’s Transformers Live Action Movie Series (a.k.a. Bayverse) helped the Franchise to get in touch with the modern audience and make the characters household names once again. We look forward to see what the series has to offer in the future. Transformers MP-11SW Skywarp Masterpiece Takara USA??SELLER! Hello, fellow Transformers Live Action Movie fans. We are back with another Transformers Universe: Bumblebee movie news roundup. Surprising everyone, it was confirmed last week that the principal photography for the new movie has entered its final days. By the time Hailee Steinfeld (star actress of the movie who plays the role of Charlie Watson) Instagrammed a concealed script last Thursday, the movie has entered Day 53 out of 70 days of filming. Of course we knew that the movie had a significantly smaller budget than its predecessors, and it feels like yesterday when The Bumblebee Movie began production on July 31st. Only very little info came out of the sets and we believe it is mostly due to the fact of keeping away from busy cities such as Chicago where a large number of onlookers would send out info into social media. We expect the movie to conclude principal photography somewhere around early November and therefore giving a little more than a year for post production and marketing. Meanwhile, John Cena confirmed his role as a Sector 7 agent through his official Twitter account. Mr. Cena was spotted wearing a S7 uniform with a nametag indicating a possible surname titled as Burns. The movie is currently being filmed in Long Beach, California which includes Night Shoots. Several on-set photos are also available via Instagram and Snapchat. You can check them out, after the jump. Transformers Universe: Bumblebee is directed by award winning director Travis Knight based on a script written by Christina Hodson and starring Hailee Steinfeld, John Cena, Jorge Lendeborg Jr., Pamela Adlon, Jason Drucker, Abby Quinn, Rachel Crow, Ricardo Hoyos and Gracie Dzienny. It was a busy week for all of us here at TFW2005. NYCC 2017 was in full swing, but sadly yielded no new info for the Movieverse toy collector. Let us put that away in the past: You are now joining with us on our weekly Transformers Universe: Bumblebee movie news update. Last week started off with a surprising yet welcome news. Legendary voice actor Peter Cullen confirmed that his voice will be featured as Optimus Prime for the Bumblebee movie. 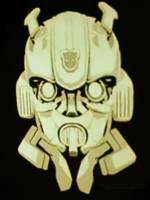 We expect a possible cameo appearance of the Autobot leader or a voice message giving instructions to Bumblebee on Earth. We are yet to see a truck resembling Optimus rolling out on the set. As we moved further along the week, news was scarce. It may have been due to the fact that principal photography was being moved from Santa Cruz to Los Angeles. 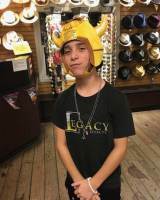 Our first image came from none other than the You Tube sensation Christian Busath (dubbed by the fans as The Fruit Ninja). It is possible that Mr. Busath will have a comedic role. Christian, updated his official Facebook page with some behind the scenes images featuring star actress Hailee Steinfeld with the iconic Volkswagen Beetle. 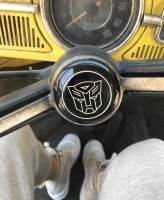 Speaking of which, Hailee Instagrammed a photo of the interior of the car which features a nice steering wheel with an Autobot logo. Out of nowhere, John Cena entered the arena as a Sector 7 agent. Even more images surfaced; confirming the name of his role as ‘Burns‘. It seems like a nice little homage to the Burns family of Transformers: Rescue Bots. Cena was not alone. Accompanying him is a group of military uniform clad soldiers with vehicles decked out with the same sort of harpoons used on the first Transformers movie to capture Bumblebee. Jorge Lendeborg Jr. was also seen acting with Ms. Steinfeld. Finally, we learned that the filming will be shifted to an undisclosed location at Long Beach, California on October 13th. We’ll see you next week with another roundup update. Till then, stay safe and check out the images attached with this news post. Have a wonderful week ahead.